These highlights do not include all the information needed to use X GEVA ® safely and effectively. See full prescribing information for X GEVA . Hypersensitivity reactions including anaphylaxis may occur. Discontinue permanently if a clinically significant reaction occurs (5.2). To report SUSPECTED ADVERSE REACTIONS, contact Amgen Inc. at 1-800-77-AMGEN (1-800-772-6436) or FDA at 1-800-FDA-1088 or www.fda.gov/medwatch. Xgeva is indicated for the prevention of skeletal-related events in patients with multiple myeloma and in patients with bone metastases from solid tumors. Xgeva is indicated for the treatment of adults and skeletally mature adolescents with giant cell tumor of bone that is unresectable or where surgical resection is likely to result in severe morbidity [see Clinical Trials (14.2)]. Xgeva is indicated for the treatment of hypercalcemia of malignancy refractory to bisphosphonate therapy. Xgeva is intended for subcutaneous route only and should not be administered intravenously, intramuscularly, or intradermally. The recommended dose of Xgeva is 120 mg administered as a subcutaneous injection every 4 weeks in the upper arm, upper thigh, or abdomen. Administer calcium and vitamin D as necessary to treat or prevent hypocalcemia [see Warnings and Precautions (5.3)]. The recommended dose of Xgeva is 120 mg administered every 4 weeks with additional 120 mg doses on Days 8 and 15 of the first month of therapy. Administer subcutaneously in the upper arm, upper thigh, or abdomen. Visually inspect Xgeva for particulate matter and discoloration prior to administration. Xgeva is a clear, colorless to pale yellow solution that may contain trace amounts of translucent to white proteinaceous particles. Do not use if the solution is discolored or cloudy or if the solution contains many particles or foreign particulate matter. Prior to administration, Xgeva may be removed from the refrigerator and brought to room temperature (up to 25°C/77°F) by standing in the original container. This generally takes 15 to 30 minutes. Do not warm Xgeva in any other way [see How Supplied/Storage and Handling (16)]. Use a 27-gauge needle to withdraw and inject the entire contents of the vial. Do not re-enter the vial. Discard vial after single-dose or entry. Injection: 120 mg/1.7 mL (70 mg/mL) solution in a single-dose vial. Pre-existing hypocalcemia must be corrected prior to initiating therapy with Xgeva [see Warnings and Precautions (5.3)]. Xgeva is contraindicated in patients with known clinically significant hypersensitivity to Xgeva [see Warnings and Precautions (5.2) and Adverse Reactions (6.2)]. 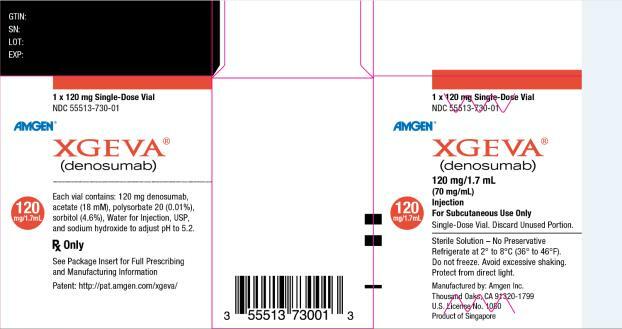 Xgeva includes the same active ingredient (denosumab) found in Prolia. Patients receiving Xgeva should not take Prolia. Clinically significant hypersensitivity including anaphylaxis has been reported with use of Xgeva. Reactions may include hypotension, dyspnea, upper airway edema, lip swelling, rash, pruritus, and urticaria. If an anaphylactic or other clinically significant allergic reaction occurs, initiate appropriate therapy and discontinue Xgeva therapy permanently [see Contraindications (4.2) and Adverse Reactions (6.2)]. Xgeva can cause severe symptomatic hypocalcemia, and fatal cases have been reported. Correct pre-existing hypocalcemia prior to Xgeva treatment. Monitor calcium levels, throughout Xgeva therapy, especially in the first weeks of initiating therapy, and administer calcium, magnesium, and vitamin D as necessary. Monitor levels more frequently when Xgeva is administered with other drugs that can also lower calcium levels. Advise patients to contact a healthcare provider for symptoms of hypocalcemia [see Contraindications (4.1), Adverse Reactions (6.1, 6.2), and Patient Counseling Information (17)]. An increased risk of hypocalcemia has been observed in clinical trials of patients with increasing renal dysfunction, most commonly with severe dysfunction (creatinine clearance less than 30 mL/minute and/or on dialysis), and with inadequate/no calcium supplementation. Monitor calcium levels and calcium and vitamin D intake [see Adverse Reactions (6.1), Use in Specific Populations (8.6), and Clinical Pharmacology (12.3)]. Osteonecrosis of the jaw (ONJ) has been reported in patients receiving Xgeva, manifesting as jaw pain, osteomyelitis, osteitis, bone erosion, tooth or periodontal infection, toothache, gingival ulceration, or gingival erosion. Persistent pain or slow healing of the mouth or jaw after dental surgery may also be manifestations of ONJ. In clinical trials in patients with cancer, the incidence of ONJ was higher with longer duration of exposure [see Adverse Reactions (6.1)]. Seventy-nine percent of patients with ONJ had a history of tooth extraction, poor oral hygiene, or use of a dental appliance as a predisposing factor. Other risk factors for the development of ONJ include immunosuppressive therapy, treatment with angiogenesis inhibitors, systemic corticosteroids, diabetes, and gingival infections. Similarly, for Xgeva patients with multiple myeloma that developed ONJ, 58% had a history of invasive dental procedures as a predisposing factor. Perform an oral examination and appropriate preventive dentistry prior to the initiation of Xgeva and periodically during Xgeva therapy. Advise patients regarding oral hygiene practices. Avoid invasive dental procedures during treatment with Xgeva. Consider temporary discontinuation of Xgeva therapy if an invasive dental procedure must be performed. There are no data available to suggest the optimal duration of treatment interruption. Patients who are suspected of having or who develop ONJ while on Xgeva should receive care by a dentist or an oral surgeon. In these patients, extensive dental surgery to treat ONJ may exacerbate the condition. Clinical judgment of the treating healthcare provider should guide the management plan of each patient based on individual risk/benefit assessment. Atypical femoral fracture has been reported with Xgeva [see Adverse Reactions (6.1)]. These fractures can occur anywhere in the femoral shaft from just below the lesser trochanter to above the supracondylar flare and are transverse or short oblique in orientation without evidence of comminution. Atypical femoral fractures most commonly occur with minimal or no trauma to the affected area. They may be bilateral and many patients report prodromal pain in the affected area, usually presenting as dull, aching thigh pain, weeks to months before a complete fracture occurs. A number of reports note that patients were also receiving treatment with glucocorticoids (e.g. prednisone) at the time of fracture. During Xgeva treatment, patients should be advised to report new or unusual thigh, hip, or groin pain. Any patient who presents with thigh or groin pain should be suspected of having an atypical fracture and should be evaluated to rule out an incomplete femur fracture. Patient presenting with an atypical femur fracture should also be assessed for symptoms and signs of fracture in the contralateral limb. Interruption of Xgeva therapy should be considered, pending a risk/benefit assessment, on an individual basis. Clinically significant hypercalcemia requiring hospitalization and complicated by acute renal injury has been reported in Xgeva-treated patients with giant cell tumor of bone and patients with growing skeletons. Hypercalcemia has been reported within the first year after treatment discontinuation. After treatment is discontinued, monitor patients for signs and symptoms of hypercalcemia, assess serum calcium periodically, reevaluate the patientâ€™s calcium and vitamin D supplementation requirements and manage patients as clinically appropriate [see Adverse Reactions (6) and Use in Specific Populations (8.4)]. Multiple vertebral fractures (MVF) have been reported following discontinuation of treatment with denosumab. Patients at higher risk for MVF include those with risk factors for or a history of osteoporosis or prior fractures. When Xgeva treatment is discontinued, evaluate the individual patientâ€™s risk for vertebral fractures [see Patient Counseling Information (17)]. Based on data from animal studies and its mechanism of action, Xgeva can cause fetal harm when administered to a pregnant woman. In animal reproduction studies, administration of denosumab to cynomolgus monkeys throughout pregnancy at a dose 25-fold higher than the recommended human dose of Xgeva based on body weight resulted in increased fetal loss, stillbirths, and postnatal mortality, along with evidence of absent peripheral lymph nodes, abnormal bone growth and decreased neonatal growth. Verify the pregnancy status of females of reproductive potential prior to the initiation of Xgeva. Advise pregnant women and females of reproductive potential that exposure to Xgeva during pregnancy or within 5 months prior to conception can result in fetal harm. Advise females of reproductive potential to use effective contraception during therapy, and for at least 5 months after the last dose of Xgeva [see Use in Specific Populations (8.1, 8.3) and Clinical Pharmacology (12.1)]. The safety of Xgeva was evaluated in three randomized, double-blind, double-dummy trials [see Clinical Trials (14.1)] in which a total of 2841 patients with bone metastasis from prostate cancer, breast cancer, or other solid tumors, or lytic bony lesions from multiple myeloma received at least one dose of Xgeva. In Studies 20050136, 20050244, and 20050103, patients were randomized to receive either 120 mg of Xgeva every 4 weeks as a subcutaneous injection or 4 mg (dose adjusted for reduced renal function) of zoledronic acid every 4 weeks by intravenous (IV) infusion. Entry criteria included serum calcium (corrected) from 8 to 11.5 mg/dL (2 to 2.9 mmol/L) and creatinine clearance 30 mL/min or greater. Patients who had received IV bisphosphonates were excluded, as were patients with prior history of ONJ or osteomyelitis of the jaw, an active dental or jaw condition requiring oral surgery, non-healed dental/oral surgery, or any planned invasive dental procedure. During the study, serum chemistries including calcium and phosphorus were monitored every 4 weeks. Calcium and vitamin D supplementation was recommended but not required. The median duration of exposure to Xgeva was 12 months (range: 0.1-41) and median duration on-study was 13 months (range: 0.1-41). Of patients who received Xgeva, 46% were female. Eighty-five percent were White, 5% Hispanic/Latino, 6% Asian, and 3% Black. The median age was 63 years (range: 18-93). Seventy-five percent of patients who received Xgeva received concomitant chemotherapy. The most common adverse reactions in patients (incidence greater than or equal to 25%) were fatigue/asthenia, hypophosphatemia, and nausea (see Table 1). The most common serious adverse reaction was dyspnea. The most common adverse reactions resulting in discontinuation of Xgeva were osteonecrosis and hypocalcemia. Severe hypocalcemia (corrected serum calcium less than 7 mg/dL or less than 1.75 mmol/L) occurred in 3.1% of patients treated with Xgeva and 1.3% of patients treated with zoledronic acid. Of patients who experienced severe hypocalcemia, 33% experienced 2 or more episodes of severe hypocalcemia and 16% experienced 3 or more episodes [see Warnings and Precautions (5.3) and Use in Specific Populations (8.6)]. Severe hypophosphatemia (serum phosphorus less than 2 mg/dL or less than 0.6 mmol/L) occurred in 15.4% of patients treated with Xgeva and 7.4% of patients treated with zoledronic acid. In the primary treatment phases of Studies 20050136, 20050244, and 20050103, ONJ was confirmed in 1.8% of patients in the Xgeva group (median exposure of 12.0 months; range: 0.1-40.5) and 1.3% of patients in the zoledronic acid group. The trials in patients with breast (Study 20050136) or prostate (Study 20050103) cancer included an Xgeva open label extension treatment phase where patients were offered Xgeva 120 mg once every 4 weeks (median overall exposure of 14.9 months; range: 0.1-67.2). The patient-year adjusted incidence (number of events per 100 patient years) of confirmed ONJ was 1.1% during the first year of treatment, 3.7% in the second year, and 4.6% per year thereafter. The median time to ONJ was 20.6 months (range: 4-53) [see Warnings and Precautions (5.4)]. In a placebo-controlled clinical trial with an extension treatment phase evaluating Xgeva for the prevention of bone metastases in patients with non-metastatic prostate cancer (a patient population for which Xgeva is not indicated), with longer treatment exposure of up to 7 years, the patient-year adjusted incidence (number of events per 100 patient years) of confirmed ONJ was 1.1% during the first year of treatment, 3.0% in the second year, and 7.1% per year thereafter. Atypical femoral fracture has been reported with Xgeva [see Warnings and Precautions (5.5)]. The safety of Xgeva was evaluated in an international, randomized (1:1), double-blind, active-controlled trial of patients with newly diagnosed multiple myeloma with treatment through disease progression [see Clinical Trials (14.2)]. In this trial, patients received 120 mg Xgeva every 4 weeks as a subcutaneous injection (n = 850) or 4 mg (dose adjusted for renal function) of zoledronic acid intravenously (IV) every 4 weeks by IV infusion (n = 852). Entry criteria included serum calcium (corrected) from 8 to 11.5 mg/dL (2 to 2.9 mmol/L) and creatinine clearance 30 mL/min or greater. Patients who had received IV bisphosphonates were excluded, as were patients with prior history of ONJ or osteomyelitis of the jaw, an active dental or jaw condition requiring oral surgery, non-healed dental/oral surgery, or any planned invasive dental procedure. During the study, serum chemistries including calcium and phosphorus were monitored every 4 weeks. Calcium and vitamin D supplementation was recommended but not required. The median duration of exposure to Xgeva was 16 months (range: 1-50) and median duration on-study was 17 months (range: 0.0-49). Of patients who received Xgeva, 46% were female, 83% percent were White, 13% Asian, 3% Black or African American, and 4% Hispanic/Latino. The median age of the patients randomized to Xgeva was 63 years (range: 29-91) and all patients who received Xgeva received concomitant anti-myeloma chemotherapy. The adverse reaction profile of Xgeva in patients with multiple myeloma, Study 2009482, was similar to that observed in Studies 20050136, 20050244, and 20050103. The most common adverse reactions (incidence â‰¥ 10%) were diarrhea (34%), nausea (32%), anemia (22%), back pain (21%), thrombocytopenia (19%), peripheral edema (17%), hypocalcemia (16%), upper respiratory tract infection (15%), rash (14%), and headache (11%). The most common serious adverse reaction (incidence â‰¥ 5%) was pneumonia (8%). The most common adverse reaction resulting in discontinuation of Xgeva (â‰¥ 1.0%) was osteonecrosis of the jaw. Severe hypocalcemia (corrected serum calcium less than 7 mg/dL or less than 1.75 mmol/L) and severe hypophosphatemia (serum phosphorus less than 2 mg/dL or less than 0.6 mmol/L) occurred in 2% and 21% patients treated with Xgeva, respectively. In the primary treatment phase of Study 2009482, ONJ was confirmed in 4.1% of patients in the Xgeva group (median exposure of 16 months; range: 1-50) and 2.8% of patients in the zoledronic acid group (median 15 months, range: 1-45 months). At the completion of the double-blind treatment phase of Study 2009482, the patient-year adjusted incidence (number of events per 100 patient years) of confirmed ONJ in the Xgeva group (median exposure of 19.4 months; range 1-52) was 2.0% during the first year of treatment, 5.0% in the second year, and 4.5% per year thereafter. The median time to ONJ was 18.7 months (range: 1-44) [see Warnings and Precautions (5.4)]. The safety of Xgeva was evaluated in two single arm trials (Study 20062004 and Study 20040215) [see Clinical Trials (14.3)] in which a total of 304 adult or skeletally mature adolescent patients with giant cell tumor of bone received at least 1 dose of Xgeva. Patients received 120 mg Xgeva subcutaneously every 4 weeks with additional 120 mg doses on Days 8 and 15 of the first month of therapy. Patients receiving concurrent bisphosphonate therapy were excluded from enrollment in both studies. Patients with prior history of ONJ or osteomyelitis of the jaw, an active dental or jaw condition requiring oral surgery, non-healed dental/oral surgery, or any planned invasive dental procedure were excluded from enrollment in Study 20040215. During the trial, serum chemistries including calcium and phosphorus were monitored every 4 weeks. Calcium and vitamin D supplementation was recommended but not required. Of the 304 patients who received Xgeva, 145 patients were treated with Xgeva for â‰¥ 1 year, 44 patients for â‰¥ 2 years, and 15 patients for â‰¥ 3 years. The median number of doses received was 14 (range: 1-60 doses) and the median number of months on study was 11 (range: 0-54 months). Fifty-eight percent of the enrolled patients were women and 80% were White. The median age was 33 years (range: 13-83 years); a total of 10 patients were skeletally mature adolescents (13 to 17 years of age). The adverse reaction profile of Xgeva in patients with giant cell tumor of bone was similar to that reported in Studies 20050136, 20050244, and 20050103. The most common adverse reactions in patients (incidence â‰¥ 10%) were arthralgia, headache, nausea, back pain, fatigue, and pain in extremity. The most common serious adverse reactions were osteonecrosis of the jaw and osteomyelitis (incidence of 0.7%). The most common adverse reactions resulting in discontinuation of Xgeva were osteonecrosis of the jaw (incidence of 0.7%), and tooth abscess or tooth infection (incidence of 0.7%). The adverse reaction profile appeared similar in skeletally mature adolescents and adults. Moderate hypocalcemia (corrected serum calcium less than 8 to 7 mg/dL or less than 2 to 1.75 mmol/L) occurred in 2.6% of patients treated with Xgeva. Severe hypophosphatemia (serum phosphorus less than 2 to 1 mg/dL or less than 0.6 to 0.3 mmol/L) occurred in 29 patients (9.5%). In Study 20062004 and Study 20040215, ONJ was confirmed in 4 of 304 (1.3%) patients who received Xgeva. The median time to ONJ was 16 months (range: 13-20 months) [see Warnings and Precautions (5.4)]. Xgeva was evaluated in an open-label, single-arm trial (Study 20070315) in which 33 patients with hypercalcemia of malignancy (with or without bone metastases) refractory to treatment with intravenous bisphosphonate therapy were enrolled [see Clinical Trials (14.4)]. The adverse reaction profile of Xgeva in patients with hypercalcemia of malignancy was similar to that reported in Studies 20050136, 20050244, 20050103, 20062004, and 20040215. Adverse reactions occurring in greater than 20% of patients were nausea (30%), dyspnea (27%), decreased appetite (24%), headache (24%), peripheral edema (24%), vomiting (24%), anemia (21%), constipation (21%), and diarrhea (21%). The following adverse reactions of Grade 3 or greater severity related to study therapy were reported on study: fatigue (3%) and infection (6%). Grade 3 laboratory abnormalities included hypomagnesemia (3%), hypokalemia (3%), and hypophosphatemia (76%) of patients. No deaths on study were related to Xgeva therapy. The following adverse reactions have been identified during postapproval use of Xgeva. Because these reactions are reported voluntarily from a population of uncertain size, it is not always possible to reliably estimate their frequency or establish a causal relationship to drug exposure. Hypocalcemia: Severe symptomatic hypocalcemia, including fatal cases [see Contraindications (4.1) and Warnings and Precautions (5.3)]. Hypersensitivity, including anaphylactic reactions [see Contraindications (4.2) and Warnings and Precautions (5.2)]. Musculoskeletal pain, including severe musculoskeletal pain. Positive rechallenge has been reported. As with all therapeutic proteins, there is potential for immunogenicity. The detection of antibody formation is highly dependent on the sensitivity and specificity of the assay. Additionally, the observed incidence of antibody (including neutralizing antibody) positivity in an assay may be influenced by several factors including assay methodology, sample handling, timing of sample collection, concomitant medications, and underlying disease. For these reasons, comparison of the incidence of antibodies to denosumab in the studies described below with the incidence of antibodies to other studies or to other products may be misleading. Using an electrochemiluminescent bridging immunoassay, less than 1% (7/2758) of patients with osseous metastases treated with denosumab doses ranging from 30-180 mg every 4 weeks or every 12 weeks for up to 3 years tested positive for binding antibodies. None of the 304 patients with giant cell tumor of bone in Study 20062004 and Study 20040215 tested positive for binding antibodies. In multiple myeloma patients in Study 20090482, 1 out of 199 patients with a post baseline result, tested positive for binding antibodies. No patient with positive binding antibodies tested positive for neutralizing antibodies as assessed using a chemiluminescent cell-based in vitro biological assay. There was no evidence of altered pharmacokinetic profile, toxicity profile, or clinical response associated with binding antibody development. Based on findings in animals and its mechanism of action, Xgeva can cause fetal harm when administered to a pregnant woman [see Clinical Pharmacology (12.1)]. There are insufficient data with denosumab use in pregnant women to inform any drug associated risks for adverse developmental outcomes. In utero denosumab exposure from cynomolgus monkeys dosed monthly with denosumab throughout pregnancy at a dose 25-fold higher than the recommended human dose of Xgeva based on body weight resulted in increased fetal loss, stillbirths, and postnatal mortality; and absent lymph nodes, abnormal bone growth, and decreased neonatal growth (see Data). Apprise pregnant women of the potential risk to the fetus. The background rate of major birth defects and miscarriage is unknown for the indicated population. In the U.S. general population, the estimated background risk of major birth defects and miscarriage in clinically recognized pregnancies is 2-4% and 15-20%, respectively. The effects of denosumab on prenatal development have been studied in both cynomolgus monkeys and genetically engineered mice in which RANK ligand (RANKL) expression was turned off by gene removal (a â€œknockout mouseâ€). In cynomolgus monkeys dosed subcutaneously with denosumab throughout pregnancy starting at gestational day 20 and at a pharmacologically active dose 25-fold higher than the recommended human dose of Xgeva based on body weight, there was increased fetal loss during gestation, stillbirths, and postnatal mortality. Other findings in offspring included absence of axillary, inguinal, mandibular, and mesenteric lymph nodes; abnormal bone growth, reduced bone strength, reduced hematopoiesis, dental dysplasia, and tooth malalignment; and decreased neonatal growth. At birth out to one month of age, infants had measurable blood levels of denosumab (22-621% of maternal levels). In RANKL knockout mice, absence of RANKL (the target of denosumab) also caused fetal lymph node agenesis and led to postnatal impairment of dentition and bone growth. Pregnant RANKL knockout mice showed altered maturation of the maternal mammary gland, leading to impaired lactation [see Use in Specific Populations (8.3) and Nonclinical Toxicology (13.2)]. There is no information regarding the presence of Xgeva (denosumab) in human milk, the effects on the breastfed child, or the effects on milk production. Denosumab was detected in the maternal milk of cynomolgus monkeys up to 1 month after the last dose of denosumab (â‰¤ 0.5% milk:serum ratio) and maternal mammary gland development was normal, with no impaired lactation. However, pregnant RANKL knockout mice showed altered maturation of the maternal mammary gland, leading to impaired lactation [see Use in Specific Populations (8.1) and Nonclinical Toxicology (13.2)]. Consider the developmental and health benefits of breastfeeding along with the motherâ€™s clinical need for Xgeva treatment and any potential adverse effects on the breastfed child from Xgeva or from the underlying maternal condition. Based on findings in animals and its mechanism of action, Xgeva can cause fetal harm when administered to a pregnant woman [see Use in Specific Populations (8.1)]. Verify the pregnancy status of females of reproductive potential prior to initiating Xgeva treatment. Advise females of reproductive potential to use effective contraception during therapy, and for at least 5 months after the last dose of Xgeva. The safety and efficacy of Xgeva have not been established in pediatric patients except in skeletally mature adolescents with giant cell tumor of bone. Xgeva is recommended only for treatment of skeletally mature adolescents with giant cell tumor of bone [see Indications and Usage (1.2)]. Clinically significant hypercalcemia after treatment discontinuation has been reported in pediatric patients with growing skeletons who received denosumab for giant cell tumor of bone or for unapproved indications [see Adverse Reactions (6.2) and Warnings and Precautions (5.6)]. Xgeva was studied in an open-label trial that enrolled a subset of 10 adolescent patients (aged 13-17 years) with giant cell tumor of bone who had reached skeletal maturity, defined by at least 1 mature long bone (e.g., closed epiphyseal growth plate of the humerus), and had a body weight â‰¥ 45 kg [see Indications and Usage (1.2) and Clinical Trials (14.3)]. A total of two of six (33%) evaluable adolescent patients had an objective response by retrospective independent assessment of radiographic response according to modified Response Evaluation Criteria in Solid Tumors (RECIST 1.1) criteria. The adverse reaction profile and efficacy results appeared to be similar in skeletally mature adolescents and adults [see Adverse Reactions (6.1) and Clinical Trials (14.3)]. Treatment with Xgeva may impair bone growth in children with open growth plates and may inhibit eruption of dentition. In neonatal rats, inhibition of RANKL (the target of Xgeva therapy) with a construct of osteoprotegerin bound to Fc (OPG-Fc) at doses â‰¤ 10 mg/kg was associated with inhibition of bone growth and tooth eruption. Adolescent primates treated with denosumab at doses 5 and 25 times (10 and 50 mg/kg dose) higher than the recommended human dose of 120 mg administered once every 4 weeks, based on body weight (mg/kg), had abnormal growth plates, considered to be consistent with the pharmacological activity of denosumab. Cynomolgus monkeys exposed in utero to denosumab exhibited bone abnormalities, reduced hematopoiesis, tooth malalignment, decreased neonatal growth, and an absence of axillary, inguinal, mandibular, and mesenteric lymph nodes. Some bone abnormalities recovered once exposure was ceased following birth; however, axillary and inguinal lymph nodes remained absent 6 months post-birth [see Use in Specific Populations (8.1)]. Of the total number of patients in clinical studies that received Xgeva (n = 2841) in Studies 20050136, 20050244, and 20050103, 1271 (44%) were â‰¥ 65 years old, while 473 patients (17%) were â‰¥ 75 years old. Of the 859 patients in Study 2009482 that received Xgeva, 387 patients (45%) were â‰¥ 65 years old, while 141 patients (16%) were â‰¥ 75 years old. No overall differences in safety or efficacy were observed between older and younger patients. Two clinical trials were conducted in patients without cancer and with varying degrees of renal function. In one study, patients (N = 55) with varying degrees of renal function (ranging from normal through end-stage renal disease requiring dialysis) received a single 60 mg subcutaneous dose of denosumab. In a second study, patients (N = 32) with severe renal dysfunction (creatinine clearance less than 30 mL/minute and/or on dialysis) were given two 120 mg subcutaneous doses of denosumab. In both studies, greater risk of developing hypocalcemia was observed with increasing renal impairment, and with inadequate/no calcium supplementation. Hypocalcemia was mild to moderate in severity in 96% of patients. Monitor calcium levels and calcium and vitamin D intake [see Warnings and Precautions (5.3), Adverse Reactions (6.1), and Clinical Pharmacology (12.3)]. There is no experience with overdosage of Xgeva. Xgeva (denosumab) is a human IgG2 monoclonal antibody that binds to human RANKL. Denosumab has an approximate molecular weight of 147 kDa and is produced in genetically engineered mammalian (Chinese hamster ovary) cells. Xgeva is a sterile, preservative-free, clear, colorless to pale yellow solution. Each single-dose vial of Xgeva contains 120 mg denosumab, acetate (18 mM), polysorbate 20 (0.01%), sorbitol (4.6%), Water for Injection (USP), and sodium hydroxide to a pH of 5.2. Xgeva binds to RANKL, a transmembrane or soluble protein essential for the formation, function, and survival of osteoclasts, the cells responsible for bone resorption, thereby modulating calcium release from bone. Increased osteoclast activity, stimulated by RANKL, is a mediator of bone pathology in solid tumors with osseous metastases. Similarly, giant cell tumors of bone consist of stromal cells expressing RANKL and osteoclast-like giant cells expressing RANK receptor, and signaling through the RANK receptor contributes to osteolysis and tumor growth. Xgeva prevents RANKL from activating its receptor, RANK, on the surface of osteoclasts, their precursors, and osteoclast-like giant cells. In patients with breast cancer and bone metastases, the median reduction in uNTx/Cr was 82% within 1 week following initiation of Xgeva 120 mg administered subcutaneously. In Studies 20050136, 20050244, and 20050103, the median reduction in uNTx/Cr from baseline to Month 3 was approximately 80% in 2075 Xgeva-treated patients. In a phase 3 study of patients with newly diagnosed multiple myeloma who received SC doses of Xgeva 120 mg every 4 weeks (Q4W), median reductions in uNTx/Cr of approximately 75% were observed by week 5. Reductions in bone turnover markers were maintained, with median reductions of 74% to 79% for uNTx/Cr from weeks 9 to 49 of continued 120 mg Q4W dosing. Following subcutaneous administration, bioavailability was 62%. Denosumab displayed nonlinear pharmacokinetics at doses below 60 mg, but approximately dose-proportional increases in exposure at higher doses. With multiple subcutaneous doses of 120 mg once every 4 weeks, up to 2.8-fold accumulation in serum denosumab concentrations was observed and steady state was achieved by 6 months. A mean (± standard deviation) serum steady-state trough concentration of 20.5 (± 13.5) mcg/mL was achieved by 6 months. The mean elimination half-life was 28 days. In patients with newly diagnosed multiple myeloma who received 120 mg every 4 weeks, denosumab concentrations appear to reach steady-state by month 6. In patients with giant cell tumor of bone, after administration of subcutaneous doses of 120 mg once every 4 weeks with additional 120 mg doses on Days 8 and 15 of the first month of therapy, mean (± standard deviation) serum trough concentrations on Day 8, 15, and one month after the first dose were 19.0 (± 24.1), 31.6 (± 27.3), 36.4 (± 20.6) mcg/mL, respectively. Steady-state was achieved in 3 months after initiation of treatment with a mean serum trough concentration of 23.4 (± 12.1) mcg/mL. Body Weight: A population pharmacokinetic analysis was performed to evaluate the effects of demographic characteristics. Denosumab clearance and volume of distribution were proportional to body weight. The steady-state exposure following repeat subcutaneous administration of 120 mg every 4 weeks to 45 kg and 120 kg subjects were, respectively, 48% higher and 46% lower than exposure of the typical 66 kg subject. Age, Gender and Race: The pharmacokinetics of denosumab was not affected by age, gender, and race. Pediatrics: The pharmacokinetics of denosumab in pediatric patients has not been assessed. Hepatic Impairment: No clinical trials have been conducted to evaluate the effect of hepatic impairment on the pharmacokinetics of denosumab. Renal Impairment: In clinical trials of 87 patients with varying degrees of renal dysfunction, including patients on dialysis, the degree of renal impairment had no effect on the pharmacokinetics and pharmacodynamics of denosumab [see Use in Specific Populations (8.6)]. No formal drug-drug interaction trials have been conducted with Xgeva. There was no evidence that various anticancer treatments affected denosumab systemic exposure and pharmacodynamic effect. Serum denosumab concentrations at 1 and 3 months and reductions in the bone turnover marker uNTx/Cr (urinary N-terminal telopeptide corrected for creatinine) at 3 months were similar in patients with and without prior intravenous bisphosphonate therapy and were not altered by concomitant chemotherapy and/or hormone therapy. The carcinogenic potential of denosumab has not been evaluated in long-term animal studies. The genotoxic potential of denosumab has not been evaluated. Denosumab had no effect on female fertility or male reproductive organs in monkeys at doses that were 6.5- to 25-fold higher than the recommended human dose of 120 mg subcutaneously administered once every 4 weeks, based on body weight (mg/kg). Because the biological activity of denosumab in animals is specific to nonhuman primates, evaluation of genetically engineered (knockout) mice or use of other biological inhibitors of the RANK/RANKL pathway, OPG-Fc and RANK-Fc, provided additional information on the pharmacodynamic properties of denosumab. RANK/RANKL knockout mice exhibited absence of lymph node formation, as well as an absence of lactation due to inhibition of mammary gland maturation (lobulo-alveolar gland development during pregnancy). Neonatal RANK/RANKL knockout mice exhibited reduced bone growth and lack of tooth eruption. A corroborative study in 2-week-old rats given the RANKL inhibitor OPG-Fc also showed reduced bone growth, altered growth plates, and impaired tooth eruption. These changes were partially reversible in this model when dosing with the RANKL inhibitors was discontinued. The safety and efficacy of Xgeva for the prevention of skeletal-related events in patients with bone metastases from solid tumors was demonstrated in three international, randomized (1:1), double-blind, active-controlled, noninferiority trials comparing Xgeva with zoledronic acid. In all three trials, patients were randomized to receive 120 mg Xgeva subcutaneously every 4 weeks or 4 mg zoledronic acid intravenously (IV) every 4 weeks (dose adjusted for reduced renal function). Patients with creatinine clearance less than 30 mL/min were excluded. In each trial, the main outcome measure was demonstration of noninferiority of time to first skeletal-related event (SRE) as compared to zoledronic acid. Supportive outcome measures were superiority of time to first SRE and superiority of time to first and subsequent SRE; testing for these outcome measures occurred if the main outcome measure was statistically significant. An SRE was defined as any of the following: pathologic fracture, radiation therapy to bone, surgery to bone, or spinal cord compression. Study 20050136 (NCT00321464) enrolled 2046 patients with advanced breast cancer and bone metastasis. Randomization was stratified by a history of prior SRE (yes or no), receipt of chemotherapy within 6 weeks prior to randomization (yes or no), prior oral bisphosphonate use (yes or no), and region (Japan or other countries). Forty percent of patients had a previous SRE, 40% received chemotherapy within 6 weeks prior to randomization, 5% received prior oral bisphosphonates, and 7% were enrolled from Japan. Median age was 57 years, 80% of patients were White, and 99% of patients were women. The median number of doses administered was 18 for denosumab and 17 for zoledronic acid. Study 20050244 (NCT00330759) enrolled 1776 adults with solid tumors other than breast and castrate-resistant prostate cancer with bone metastasis and multiple myeloma. Randomization was stratified by previous SRE (yes or no), systemic anticancer therapy at time of randomization (yes or no), and tumor type (non-small cell lung cancer, myeloma, or other). Eighty-seven percent were receiving systemic anticancer therapy at the time of randomization, 52% had a previous SRE, 64% of patients were men, 87% were White, and the median age was 60 years. A total of 40% of patients had non-small cell lung cancer, 10% had multiple myeloma, 9% had renal cell carcinoma, and 6% had small cell lung cancer. Other tumor types each comprised less than 5% of the enrolled population. The median number of doses administered was 7 for both denosumab and zoledronic acid. Study 20050103 (NCT00321620) enrolled 1901 men with castrate-resistant prostate cancer and bone metastasis. Randomization was stratified by previous SRE, PSA level (less than 10 ng/mL or 10 ng/mL or greater) and receipt of chemotherapy within 6 weeks prior to randomization (yes or no). Twenty-six percent of patients had a previous SRE, 15% of patients had PSA less than 10 ng/mL, and 14% received chemotherapy within 6 weeks prior to randomization. Median age was 71 years and 86% of patients were White. The median number of doses administered was 13 for denosumab and 11 for zoledronic acid. Xgeva delayed the time to first SRE following randomization as compared to zoledronic acid in patients with breast or castrate-resistant prostate cancer (CRPC) with osseous metastases (Table 2). In patients with bone metastasis due to other solid tumors or lytic lesions due to multiple myeloma, Xgeva was noninferior to zoledronic acid in delaying the time to first SRE following randomization. Overall survival and progression-free survival were similar between arms in all three trials. a CRPC = castrate-resistant prostate cancer. b NR = not reached. c Superiority testing performed only after denosumab demonstrated to be noninferior to zoledronic acid within trial. d All skeletal events postrandomization; new events defined by occurrence â‰¥ 21 days after preceding event. e Adjusted p-values are presented. The efficacy of Xgeva for the prevention of skeletal-related events in newly diagnosed multiple myeloma patients with treatment through disease progression, was evaluated in Study 20090482 (NCT01345019), an international, randomized (1:1), double-blind, active-controlled, noninferiority trial comparing Xgeva with zoledronic acid. In this trial, patients were randomized to receive 120 mg Xgeva subcutaneously every 4 weeks or 4 mg zoledronic acid intravenously (IV) every 4 weeks (dose adjusted for reduced renal function). Patients with creatinine clearance less than 30 mL/min were excluded. In this trial, the main efficacy outcome measure was noninferiority of time to first skeletal-related event (SRE). Additional efficacy outcome measures were superiority of time to first SRE, time to first and subsequent SRE, and overall survival. An SRE was defined as any of the following: pathologic fracture, radiation therapy to bone, surgery to bone, or spinal cord compression. Study 20090482 enrolled 1718 newly diagnosed multiple myeloma patients with bone lesions. Randomization was stratified by a history of prior SRE (yes or no), the anti-myeloma agent being utilized/planned to be utilized in first-line therapy (novel therapy-based or non-novel therapy-based [novel therapies include bortezomib, lenalidomide, or thalidomide]), intent to undergo autologous PBSC transplantation (yes or no), stage at diagnosis (International Staging System I or II or III) and region Japan (yes or no). At study enrollment, 96% of the patients were receiving or planning to receive novel therapy based first-line anti-myeloma therapy, 55% of the patients intended to undergo autologous PBSC transplantation, 61% of patients had a previous SRE, 32% were at ISS stage I, 38% were at ISS stage II and 29% were at ISS Stage III, and 2% were enrolled from Japan. Median age was 63 years, 82% of patients were White, and 46% of patients were women. The median number of doses administered was 16 for Xgeva and 15 for zoledronic acid. Xgeva was noninferior to zoledronic acid in delaying the time to first SRE following randomization (HR = 0.98, 95% CI, 0.85-1.14). The results for overall survival (OS) were comparable between Xgeva and zoledronic acid treatment groups with a hazard ratio of 0.90 (95% CI: 0.70, 1.16). The safety and efficacy of Xgeva for the treatment of giant cell tumor of bone in adults or skeletally mature adolescents were demonstrated in two open-label trials [Study 20062004 (NCT00680992) and Study 20040215 (NCT00396279)] that enrolled patients with histologically confirmed measurable giant cell tumor of bone that was either recurrent, unresectable, or for which planned surgery was likely to result in severe morbidity. Patients received 120 mg Xgeva subcutaneously every 4 weeks with additional doses on Days 8 and 15 of the first cycle of therapy. Study 20062004 was a single arm, pharmacodynamic, and proof of concept trial conducted in 37 adult patients with unresectable or recurrent giant cell tumor of bone. Patients were required to have histologically confirmed giant cell tumor of bone and radiologic evidence of measurable disease from a computed tomography (CT) or magnetic resonance imaging (MRI) obtained within 28 days prior to study enrollment. Patients enrolled in Study 20062004 underwent CT or MRI assessment of giant cell tumor of bone at baseline and quarterly during Xgeva treatment. Study 20040215 was a parallel-cohort, proof of concept, and safety trial conducted in 282 adult or skeletally mature adolescent patients with histologically confirmed giant cell tumor of bone and evidence of measurable active disease. Study 20040215 enrolled 10 patients who were 13 - 17 years of age [see Use in Specific Populations (8.4)]. Patients enrolled into one of three cohorts: Cohort 1 enrolled 170 patients with surgically unsalvageable disease (e.g., sacral or spinal sites of disease, or pulmonary metastases); Cohort 2 enrolled 101 patients with surgically salvageable disease where the investigator determined that the planned surgery was likely to result in severe morbidity (e.g., joint resection, limb amputation, or hemipelvectomy); Cohort 3 enrolled 11 patients who previously participated in Study 20062004. Patients underwent imaging assessment of disease status at intervals determined by their treating physician. An independent review committee evaluated objective response in 187 patients enrolled and treated in Study 20062004 and Study 20040215 for whom baseline and at least one post-baseline radiographic assessment were available (27 of 37 patients enrolled in Study 20062004 and 160 of 270 patients enrolled in Cohorts 1 and 2 of Study 20040215). The primary efficacy outcome measure was objective response rate using modified Response Evaluation Criteria in Solid Tumors (RECIST 1.1). The overall objective response rate (RECIST 1.1) was 25% (95% CI: 19, 32). All responses were partial responses. The estimated median time to response was 3 months. In the 47 patients with an objective response, the median duration of follow-up was 20 months (range: 2-44 months), and 51% (24/47) had a duration of response lasting at least 8 months. Three patients experienced disease progression following an objective response. The safety and efficacy of Xgeva was demonstrated in an open-label, single-arm trial [Study 20070315 (NCT00896454)] that enrolled 33 patients with hypercalcemia of malignancy (with or without bone metastases) refractory to treatment with intravenous bisphosphonate therapy. Patients received Xgeva subcutaneously every 4 weeks with additional 120 mg doses on Days 8 and 15 of the first month of therapy. In this trial, refractory hypercalcemia of malignancy was defined as an albumin-corrected calcium of > 12.5 mg/dL (3.1 mmol/L) despite treatment with intravenous bisphosphonate therapy in 7-30 days prior to initiation of Xgeva therapy. 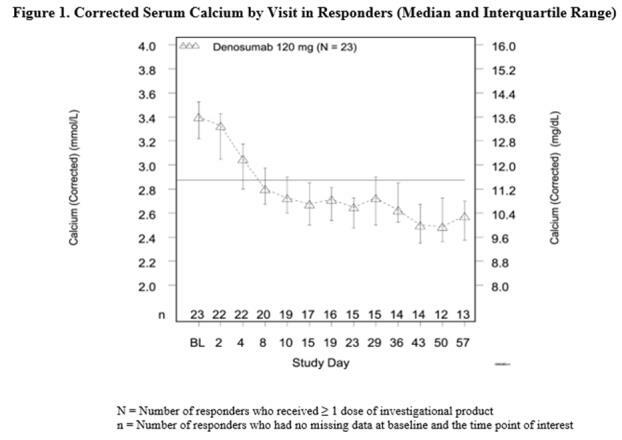 The primary outcome measure was the proportion of patients achieving a response, defined as corrected serum calcium (CSC) â‰¤ 11.5 mg/dL (2.9 mmol/L), within 10 days after Xgeva administration. Efficacy data are summarized in Figure 1 and Table 4. Concurrent chemotherapy did not appear to affect response to Xgeva. Median time to response (CSC â‰¤ 11.5 mg/dL) was 9 days (95% CI: 8, 19), and the median duration of response was 104 days (95% CI: 7, not estimable). Median time to complete response (CSC â‰¤ 10.8 mg/dL) was 23 days (95% CI: 9, 36), and the median duration of complete response was 34 days (95% CI: 1, 134). Xgeva is supplied in a single-dose vial. Store Xgeva in a refrigerator at 2°C to 8°C (36°F to 46°F) in the original carton. Do not freeze. Once removed from the refrigerator, Xgeva must not be exposed to temperatures above 25°C/77°F or direct light and must be used within 14 days. Discard Xgeva if not used within the 14 days. Do not use Xgeva after the expiry date printed on the label. Protect Xgeva from direct light and heat. Avoid vigorous shaking of Xgeva. Advise patients that denosumab is also marketed as Prolia, and if taking Xgeva, they should not receive Prolia [see Warnings and Precautions (5.1)]. Advise patients to seek prompt medical attention if signs or symptoms of hypersensitivity reactions occur. Advise patients who have had signs or symptoms of systemic hypersensitivity reactions that they should not receive denosumab (Xgeva or Prolia) [see Warnings and Precautions (5.2) and Contraindications (4.2)]. Adequately supplement patients with calcium and vitamin D and instruct them on the importance of maintaining serum calcium levels while receiving Xgeva [see Warnings and Precautions (5.3) and Use in Specific Populations (8.6)]. Advise patients to seek prompt medical attention if they develop signs or symptoms of hypocalcemia. Advise patients to maintain good oral hygiene during treatment with Xgeva and to inform their dentist prior to dental procedures that they are receiving Xgeva. Patients should avoid invasive dental procedures during treatment with Xgeva and inform their healthcare provider or dentist if they experience persistent pain and/or slow healing of the mouth or jaw after dental surgery [see Warnings and Precautions (5.4)]. Advise patients to report new or unusual thigh, hip, or groin pain [see Warnings and Precautions (5.5)]. Advise patients to report nausea, vomiting, headache, and decreased alertness following treatment discontinuation [see Warnings and Precautions (5.6) and Use in Specific Populations (8.4)]. Advise patients that after treatment with Xgeva is stopped there may be an increased risk of having broken bones in the spine especially in patients who have had a fracture or who have had osteoporosis. Advise patients not to interrupt Xgeva therapy without their physicianâ€™s advice [see Warnings and Precautions (5.7)]. Advise females of reproductive potential that Xgeva can cause harm to a fetus and to inform their healthcare provider of a known or suspected pregnancy [see Warnings and Precautions (5.8) and Use in Specific Populations (8.1, 8.3)]. Advise females of reproductive potential to use effective contraception during treatment and for at least 5 months after the last dose of Xgeva [see Use in Specific Populations (8.3)]. © 2010-2018 Amgen Inc. All rights reserved. Single Use Vial. Discard Unused Portion. Do not freeze. Avoid excessive shaking.